The Dallas Police Department is asking for the public’s assistance in identifying an unknown female who was found deceased on April 4th, 2014, near St. Augustine and I-20. The murder victim has “Saldana” tattooed on her back which is written in cursive. There is also a tattoo of a dollar sign on her ring finger. 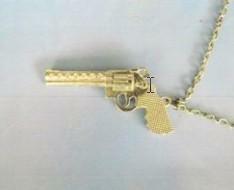 She was wearing a necklace with a pistol pendent which is shown below. If anyone has information leading to the identity of this female, please contact Detective Tabor at 214-671-3632.